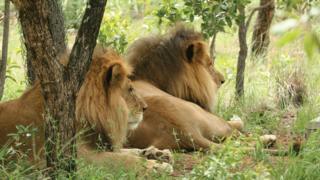 Two lions rescued from circuses in South America and relocated to South Africa have been killed by poachers. Animal Defenders International (ADI) which helped move 33 lions last year, including José and Liso, says it might offer a reward for information. The lions' heads, skins, tails and feet were removed, prompting suspicions that they were killed for ritual purposes. The crime is currently being investigated by South Africa's police and anti-poaching units. ADI head Jan Creamer said she was heartbroken over the killings. "José and Liso had suffered a terrible life of abuse but their new life in Africa had given them a new lease of life," the group said in a statement. José had suffered brain damage from blows to the head in the circus, it said. The lions had been living at the Emoya Big Cat Sanctuary, inside a 5,000-hectare private farm in the northern Limpopo province. ADI says it has placed rescued animals in sanctuaries in South Africa for 21 years and this is the first such incident.